Posted on March 10th, by Dr Rob Yeung . Another client called Rupert wanted to change his life. He wanted to get a new job – but he wasn’t able to find the motivation within himself. When we first met, he said that he never “feels like” sitting at his computer to research job opportunities and then apply for them. In fact, he often engaged in emotional eating instead. When he felt lonely or depressed, he bought a bag of Snickers or Mars bars and ate them all in one sitting. Do you ever allow your emotions to get the better of you? If you do, then you may be engaging in what I call emotion-directed actions (EDAs), in other words, allowing your emotions to dictate your actions. In contrast, many of the most successful people I know engage in what I call goal-directed actions (GDAs). So these people have goals in life, and choose to pursue actions that help them to achieve their goals in spite of how they may be feeling. The point is that you don’t have to be driven by your emotions. When you are thinking about your irrational, angry, sulky or otherwise emotional self, you can choose how you would ideally like to behave. We human beings unfortunately have an emotional system in our brains that can make us feel angry, sad, tired and so on. And these emotions can drive us to behave in ways that aren’t always good for us. 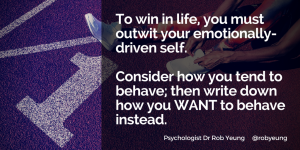 But by taking some time to think about how we would prefer to behave (and then writing down these goal-directed actions), we can help ourselves to conquer our emotions and make better progress towards our goals. Incidentally, people often think of emotional intelligence as being the skill of influencing other people, but controlling our own emotions is perhaps the more important part of becoming more emotionally intelligent. Sit down quietly for just 10 minutes. 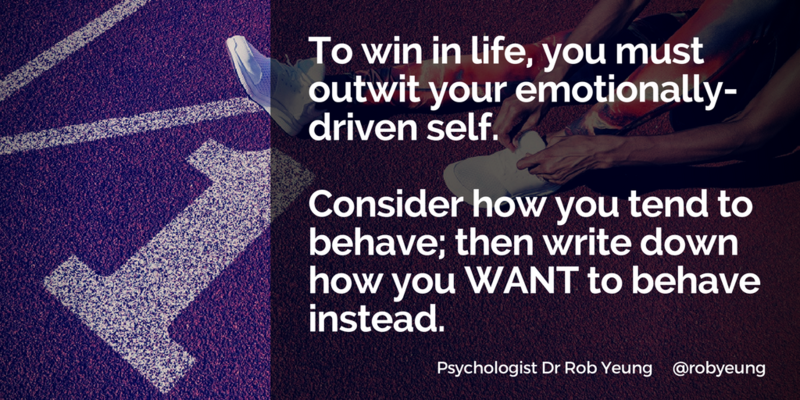 Think about how your emotions tend to get the better of you (i.e. identify your emotion-directed actions or EDAs). Then write down a handful – maybe between 1 to 5 – goal-directed actions or GDAs, which you would prefer to perform instead. Put your list of GDAs in a prominent place. And be sure to follow through with them as often as you can.